Business Intelligence (BI) is a popular buzzword you may have heard these days. The field of BI is expanding and making progress as new tools and technologies from popular vendors are emerging. DTS has experience developing BI solutions for various domains. Our knowledge and analysis regarding different Arab and Asian countries can help our clients in their business decisions. Our solutions are focused based on the most important requirements for our clients. Our current solutions involve different Microsoft based technologies for developing these solutions in particularly MS SQL Server 2008 and SQL Server Integration, Analysis & Reporting Services. With our expertise in different BI tools and technologies we are able to provide a BI solution meeting our clients’ demands. 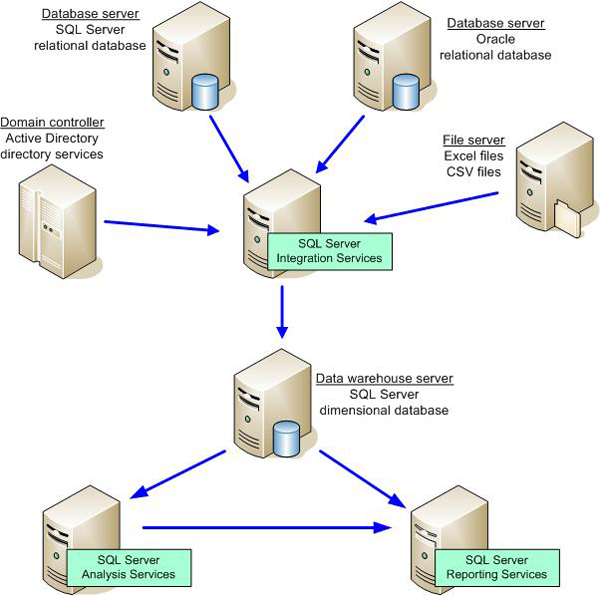 Currently we are using the complete BI suite provided by Microsoft for our solutions (see figure below; http://www.simple-talk.com/sql/learn-sql-server/sql-server-data-warehouse-cribsheet/). The current market has different business intelligence tools and technologies from different vendors. We help our clients in making the selection for the tools and technologies to be used. Our experience with these tools can help the clients in making their business more productive. In short DTS can provide the clients a solution meeting their requirements.